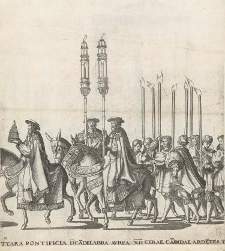 Emperor Charles V in procession after his coronation by Pope Clement VII in Bologna on 24 February 1530. A panorama in 38 numbered sheets by Nicolaus Hogenberg. 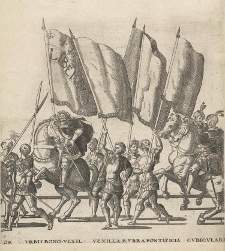 Published by: Hendrik Hondius II, The Hague, 1530-36. 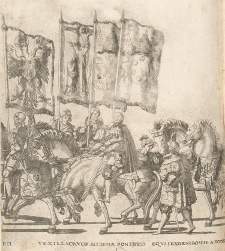 Optocht van Karel V met de paus te Bologna na zijn kroning tot keizer, 1530, Nicolaas Hogenberg. Sources: British Museum with captions and missing plates from the Rijksmuseum, Netherlands Collection. Painter, engraver and etcher. Evidently he was born in Munich, as he referred to himself as 'Monachensis' on one of the series of etchings, although his family most probably came originally from Malines, where a number of artists of this name worked. 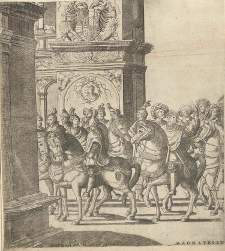 The above series, illustrating the procession of Charles after being crowned Emperor in Bologna and accompanied by Pope Clement VII, is his best known work and was almost certainly commissioned by the archduchess, Margaret of Austria. 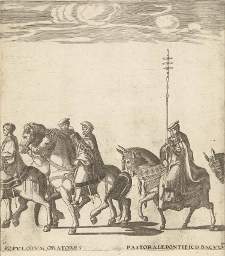 The work appeared only after her death (1530), and was probably first printed in The Hague in 1532. 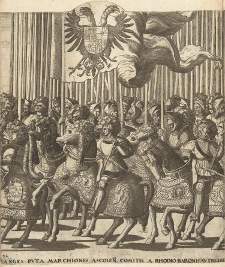 Hogenberg came to Mechelen in the Malines around 1517 / 1528, where he was certainly settled by the latter date. The Burgundian city Mechelen was the city of residence of Margaret of Austria, after she was appointed governor of the Netherlands in 1509 by her father, the Emperor Maximilian. In 1509 she was made governess of his grandchildren: Charles, the future Emperor Charles V, and his sisters Eleonore and Isabella. In Mechelen Nicolaus made contact with local artists, particularly Frans Crabbe. Here he worked under the patronage of the Regent of the Netherlands, Margaret of Austria. Nicolaus died young in 1539, leaving a wife, Jeanne Verstraeten, and a number of children, including Remigius (born c. 1535) and Frans (possibly born before his father's death in 1539 or 1540).